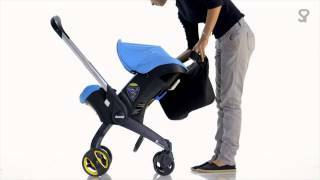 The Doona isn't just the first ever car-seat-turned-stroller – it's also the first car seat ever to handle additional storage. With the addition of the Snap-On Storage accessory, parents can bring along extra must-haves while in stroller mode. Simply attach it to the Doona's unique quick-release connectors, and hit the road. Extra storage when Doona is in mobility mode. Easy to access, even when Doona is in use. Quick-release connectors make attaching and removing the storage bag a breeze.